You may be familiar with Kate Elliot’s previous books, the Crossroads Trilogy, The Crown of Stars septology, the Novels of the Jaran, and The Golden Key, her collaboration with Melanie Rawn and Jennifer Roberson. Cold Magic, an adventurous multicultural steampunk novel is just as marvelous. In the beginning of the book, words like Iberian, clan, Beltane, poets, Romans, and Celtic bards, leap off the pages, flirting with my mind of what in our own history would mark the Celtic Iron Age. The first pages also disclose the titillating information that the main character, Cat, and her family are Phoenicians. There are few if any ancient cultures as mysterious as those daring sea-faring folks. The author stresses they are a people who can keep a secret and history has borne out the truth of that. The descriptions of her family home, the furnishings, her clothing, and the school she attends with her cousin Bee, along with their use of gaslight and the mention of airships alerts us to a time similar to the Victorian era in an alternative history. So I am intrigued from the start. One fateful night a Cold Mage barges into Cat’s home in Expedition to reclaim ownership of what her aunt and uncle had generously been allowed to keep possession of: Cat. If her Phoenician family had not been so secretive she may have been better prepared for what happened next. Not wanting to spoil the plot, I won’t give away too much to those who have not read it, and if you haven’t then you should. As anyone can guess, the suspense heightens as Cat is bond to this stranger. When the Cold Mage takes her away, it changes everything. As Cat embarks on a quest to warn her cousin Bee of impending danger, she sets off on a path of self discovery, searching for her true family and her true self. In the fascinating history of this alternative world, a battle between the Romans and the Phoenicians resulted in them keeping the sea ports while the empire of the Caesars kept the land. As the Empire grew weak, the Celts rebelled against their Roman rulers. The next major historical impact occurred when the Persians attacked North Africa and the Celtic princes in Europa welcomed the Phoenician refuges. About a hundred years later, a salt plague broke out near theSaharadesert and the North African tribes were attacked by ghouls, who rose from the salt mines. Those tribes fled and found friendship among the Celts due to similar magic and beliefs. The great mage houses grew out of this cultural blending. Some refuges from the Mali Empire guided by Phoenician navigators sailed to a western continent full of human nations and in the north, trolls. Some of these people and trolls founded the city of Expedition on the sea of Antilles. There they embraced science and new technologies, which the mage houses deplored. In this dystopian society the princes of the newly industrialized cities and mages of the countryside control the people and the workers live in inhuman conditions. Radical new ideas of choosing your own council members, what we would call – making a living wage, and having choices about your own life spread among the people, fueled by the invention of a portable printing press. Mobs form and a rebellion begins. Characters with white, brown, and black complexions and curly tight hair, coarse braided hair, and thin hair swept up in lime-washed spikes bring racial diversity to the story. There are vivid descriptions of cultural diversity as well with villages of Celtic round houses, horsemen wearing knee-length jackets with splendid turbans, and women in embroidered damask robes and elaborate coiffures of braids complemented by gold hoop earrings. 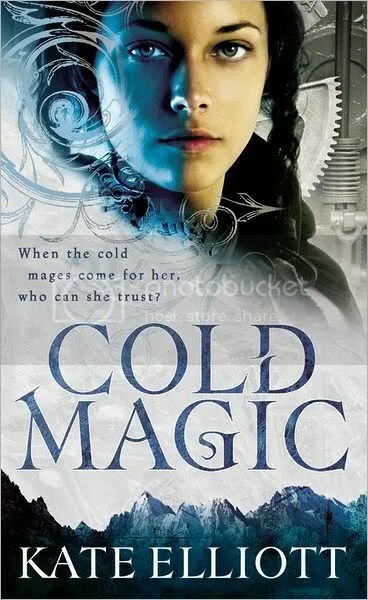 Kate Elliott refers to Cold Magic as “a mash-up of an Afro-Celtic post-Roman, icepunk Regency novel with airships, Phoenician spies, and the intelligent descendents of troodons (a small intelligent and agile species of dinosaurs)” referred to in the book as trolls. I call it a riveting adventure bursting with mystic fantasy. The writing is exquisite and I found the plot worked with ingenuous creativity. I loved it. I highly recommend Cold Magic. I’m eagerly looking forward to reading the next book in the Sprit Walker Trilogy, Cold Fire. 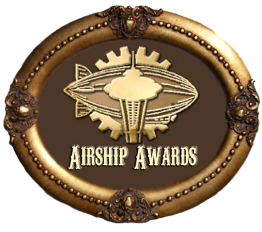 Maeve Alpin is the author of three Steampunk/Romance books: As Timeless As Stone, As Timeless As Magic, and To Love A London Ghost. Under the name Cornelia Amiri she has written ten Celtic/Romance books and one contemporary/romance set at Woodstock in 1969. Her Steampunk website is http://MaeveAlpin.com and you can contact her at MaeveAlpin@gmail.com. I just finished reviewing and reading this book of my blog. I found the first 100 pages so long winded that I almost gave it a DNF. Elliot always uses 10 words where one will do. She also began this book with a complete info dump and this creates a complete disconnect with the characters. Also while this book did include various POC, it was absolutely heteronormative in that there was not a single gay character. While I can agree that some people might find the beginning a little slow, I thought it was interesting enough and the world and characters intriguing enough that I didn’t have a problem pushing through. Maybe you should have put the book down, since it was clearly not your type of book. In the first few chapters, Andevai is trying to find Cat. He comes across her, but the man he’s with can’t see her. He doesn’t want to let on that she’s there, so he keeps mumbling about how enamored he is over this very ornate coat hanging next to her. The man he’s with instantly starts commenting on how good Andevai would look in the coat, and hits on him at least twice. Neither Andevia or Cat react as if this is gross or out of the ordinary. This is just one example, but I know there were other instances like this in both books. 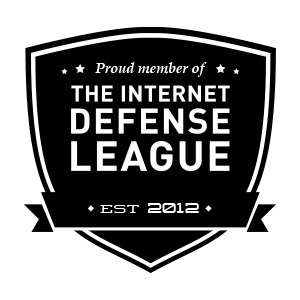 Maybe you should try paying better attention when you read, before making accusations. Wonderful review! This has become one of my favorite series, for all the reasons you mentioned. It was so refreshing to read such a unique, diverse fantasy, and I think the second book is (if possible) even better than the first. Can’t wait for the third book!